The second half of Thursday was where we got to geek out and tour various parts of CERN. I was a physics minor in college, many years ago, and had studied not just CERN, but many of the actual pieces of equipment we got to tour, so this was a great privilege. We started by touring the data center where the data from all of the various physics experiments is crunched into useful information and discoveries. This was amazing for a number of reasons. 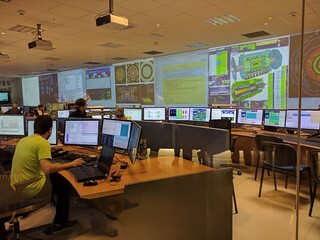 From the professional side, CERN is the largest installation of RDO – the project I work with at work – that we know of. 279 thousand cores running RDO OpenStack. For those not part of my geek world, that translates into hundreds of thousands of physical computers, arranged in racks, crunching data to unlock the secrets of the universe. For those that are part of my geek world, you can understand why this was an exciting thing to see in person and walk through. Here we have several members of the RDO and CentOS team standing in front of some of the systems that run RDO. And here we have a photo that only a geek can love – this is the actual computer on which the very first website ran. 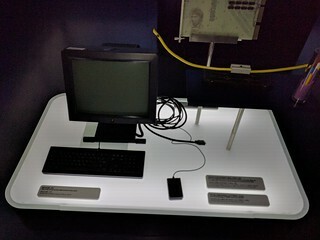 Yes, boys and girls, that’s Tim Berners-Lee’s desktop computer from the very first days of the World Wide Web. It’s ok to be jealous. There will also be some video over on my YouTube channel, but I haven’t yet had an opportunity to edit and post that stuff. Next, we visited the exhibit about the Superconducting Super Collider, also known as the Large Hadron Collider. This was stuff that I studied in college, and have geeked out about for the years since then. There are pictures from this in the larger album, but I want to point out one particular picture of something that absolutely blew my mind. Most of the experiments in the LHC involve accelerating sub-atomic particles (mostly protons) to very high speeds – very close to the speed of light – and then crashing them into something. When this happens, bits of it fly off in random directions, and the equipment has to detect those bits and learn things about them – their mass, speed, momentum, and so on. 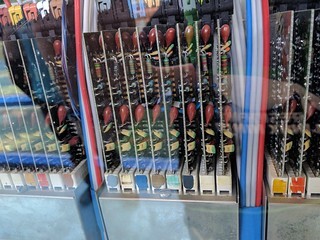 In the early days, one of the the ways that they did this was to build a large chamber and string very fine wires across it, so that when the particles hit those wires it would cause electrical impulses. Those are individual circuit boards. THOUSANDS of them, each individually hand-soldered. Those are individual resistors, capacitors, and ICs, individually soldered to boards. The amount of work involved – the dedication, time, and attention to detail – is simply staggering. This photo is perhaps 1/1000th of the total number of boards. If you’ve done any hand-soldering or electronic projects, you’ll have a small sense of the scale of this thing. I was absolutely staggered by this device. Outside on the lawn were several pieces of gigantic equipment that were used in the very early days of particle physics, and this was like having the pages of my college text book there in front of me. I think my colleagues thought I’d lost my mind a little. College was a long time ago, and most of the stuff I learned has gone away, but I still have the sense of awe of it all. That an idea (let’s smash protons together!) resulted in this stuff – and more than 10,000 people working in one place to make it happen, is really a testament to the power of the human mind. I know some of my colleagues were bored by it all, but I am still reeling a little from being there, and seeing and touching these things. I am so grateful to Tim Bell and Thomas Oulevey for making this astonishing opportunity available to me. Finally, we visited the ATLAS experiment, where they have turned the control room into a fish tank where you can watch the scientists at work. What struck me particularly here was that most of the people in the room were so young. I hope they have a sense of the amazing opportunity that they have here. I expect that a lot of these kids will go on to change the world in ways that we haven’t even thought of yet. I am immensely jealous of them. So, that was the geek chapter of our visit. Please read the rest of the series for the whole story. SSC and LHC are not the same. The Wikipedia article you’ve linked to explains the difference.